“We walked for hours under the moonlight, in silence. My heart would thump at every noise: the Turkish ‘Jandarma' could get to us at any moment. Then in the distance I finally heard the noise of the current. They made us get on some old boats and we rowed until the boat touched the other bank. I jumped in the water, clung to a branch and pulled myself up on the dry land. I could not believe it: I was in Europe”. Ahmad (that is how we are going to call him) is 23 years-old, he is Kurdish and comes from Sulaymaniyah, in Northern Iraq. Evros is the river he crossed in early July, following the dream of a new life in Europe. The river is called Meriç in Turkish and for 120 kilometers it marks the border between Turkey and Greece: it seems it is becoming the last “open door” to the European Union for migrants and those seeking political asylum. Against a general and considerable decrease of “illegal” entries in the European Union, compared to 2009 the Evros border is the only one following a strong opposite trend. According to the UNHCR, during the first 6 months of 2010 the flow of arrivals through the river increased by 3-400% compared to the same time of the year before. Apparently, there are over 10.000 migrants who have arrived in Greece through this route since the beginning of the year. The latest report from Frontex, the agency that deals with external EU borders, confirms this trend. In 2009, 8.787 migrants were stopped in Greece after crossing the Evros, 27.685 were detected on the traditional sea routes that lead to the Greek Islands from the Turkish coast. There was an inversion in the trend during the first few months of 2010, and “for the first time more migrants were detected along the Evros than in the Aegean”. Two are the most probable causes of this phenomenon: on the one hand patrolling has been strengthened along the sea routes, on the other it is cheaper to cross the river than to cross the Aegean. Crossing the Evros, though, bears an extremely high number of risks, not less than trying one’s fortune by sea. “To avoid police forces, migrants cross the river during the night”, says Dimitris Petrovic, correspondent for the Greek daily “Kathimerini” from Alexandroupoli, the capital of the Evros Prefecture. “Many cannot swim, and if there is an accident, they are done for”. Accidents happen often: a real endless repetition that is only partly reported by Authorities and the press. At the end of June, for instance, 19 people, most of them Somalis, drowned in the river. Men, women and children who, according to the UNHCR office in Greece, “very likely had very well-grounded reasons to seek asylum and protection in Europe”. Only from the beginning of 2010, 38 migrants in total died while trying to cross the Evros. The lifeless bodies recovered by the Greek Authorities are carried to the Alexandroupoli hospital, where doctors are often forced to heap them in the cold rooms of the morgue because they are too many. In a recent interview for the web-magazine SETimes, Nikos Raptopoulos, director of the hospital, recently defined this situation “horrible”. “They pass by at night, like ghosts”. Mehmet leans even more forward and lowers his voice. “There are rumors in town that two weeks ago, the Jandarma cold-bloodedly killed one of them, a few kilometers from here. He had surrendered, but the gendarme shot him anyway, right between the eyes”. Küplü. A few thousand people, lost in the August heat wrapping the last strip of European Turkey. Fields of sunflowers and silence, few cars, almost all of them belong to emigrants who are back from Germany on vacation. In the middle of the wide stretch of tarmac marking the town’s center, yet another golden statue of Atatürk, surrounded by red flags with the half moon. On the side, 2 tractors full of ripe water-melons, offered for 1 Turkish Lira each. Life gathers under the shadow of a local, where a group of men, like Mehmet, lazily sit drinking coffee. Migrants are not gladly spoken of, answers are accompanied by slight wariness and undefined gestures. “It is in small towns like Küplü, Meriç, Ipsala or Doyran that traffickers lead migrants”, Coşkun Molla had told us in Edirne, the main Turkish city very close to the Greek border. A lawyer, Coşkun Molla has long been engaged in projects targeted to informing migrants in Turkey of their rights. “They get here directly from Istanbul, by taxi, minibus, car, to then walk towards the border to try and avoid check-points”. In Küplü, the Evros/Meriç is a stone’s throw away. 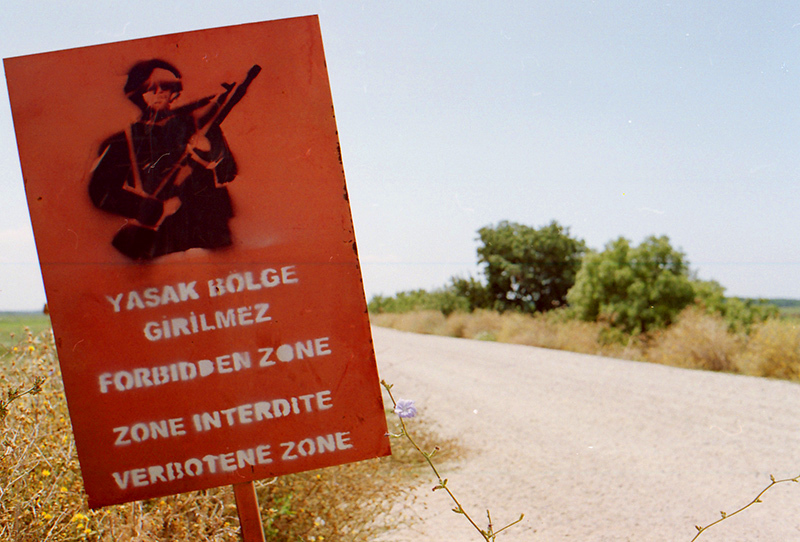 To get to the river, though, a forbidden zone has to be crossed, patrolled night and day by the Turkish ‘Jandarma’, a military police corps responsible, amongst other things, for controlling the border areas. “Jandarma, problem! Jandarma, problem!”, we hear repeated in every canton. The bad relations between Turkey and Greece generate many more risks for those trying to pass from one country to the other along the Evros. Even though they are allies in NATO, the two armies confront each other on the field, at least symbolically. At the Ipsala bridge, the only one connecting the two banks South of Edirne, a Greek infantryman and a Turkish one, with a machinegun on the shoulder and their bayonet engaged, bear testimony at the same time of the presence of the border and the ill-concealed enmity between the two states. It is further North, though, around Edirne, that the militarized border between Greece and Turkey has created the most merciless and hidden threat to migrants that have tried to cross it all these years. For a whim of history, this is the only stretch of the border not to be marked by the Evros/Meriç. In 1923, the Treaty of Lausanne, in fact, ensured Turkey the Karaağaç railway station, on the other side of the river, the only connection to the line that leads towards Bulgaria and Europe. Here the Evros can easily cross over an antique Ottoman bridge, sided by restaurants where, in spring and summer, colorful and noisy weddings are celebrated. A little further up, the border is marked by only two parallel military roads and long lines of dark trees. The danger, though invisible here, is subtle and terrible. After the Cyprus crisis in 1974, in order to protect the most uncovered part of the border, the Greek army scattered 25.000 anti-personnel and anti-tank land-mines. According to the International Campaign to Ban Landmines (ICBL), an organization working to ban these war devices that won the Nobel Peace Prize in 1997, between 2000 and 2008 at least 66 migrants were lacerated and 44 were injured in the mine fields along the border. The actual number of victims, though, is likely to be much higher. “There are persistent rumors on traffickers who have deliberately led migrants on the mine fields, maybe to check the state they were in”, says Petrovic. Notwithstanding the danger signs, during the night many migrants might have simply thought the protection fences around the fields were instead the border fences. Today the Greek Government (which signed the Treaty of Ottawa on the ban of mines) claims to have finished removing anti-personnel mines at the end of 2009. The last accident reported by the press dates back to 2008, when 4 Georgians died near the Greek town of Kastanies, right across the border. Many doubts remain, however, in that the border is completely safe. On the Greek bank of the Evros, the landscape remains immersed in the heat but is less moon-like. In the West, the final slopes of the green-dotted Rhodopes mountains descend lazily. The built-up areas become more frequent and the dazzling-plaster houses are indicators of a higher standard of living than that on the other bank, in spite of the crisis that has tormented the country in the last few months. It is on this side of the river, in sleepy towns like Soufli, Dydimoticho and Orestiada, that Mehmet’s “ghosts” appear again. “They are alone or in small groups, with their clothes still soaking, mostly during the early hours of the morning. They often go to the bus station or look for a way to go to Thessaloniki”, we are told by many in Orestiada, the main Greek town on the Evros. Everyone seems to agree on one thing: “there have never been so many migrants like this year”. Different sources talk about a new trend, more and more obvious in the past few months: soon after crossing the river, the migrants no longer try to vanish, but they turn themselves in to the police. The migrants’ choice seems to be linked to the Greek Authorities tending to withhold detained migrants for a minimum period of time, lately, maybe because of the chronic overpopulation in detention centers. While in the past detention usually lasted a few months, today many migrants are free after a few days only, with an expulsion order in their pocket inviting them to leave the country within 30 days. The fact that immigrants prefer to turn themselves in, though, does not mean there are no problems or tense moments when they meet with the Greek police. We have, indeed, collected numerous abuse accusations. “After putting us on a truck, the policemen took us to the police station. There they started hollering, they treated us like animals”, claims Ahmad. “One of my traveling companions was blood beaten because he tried to keep his cell phone instead of handing it to the police”. Obviously these accusations are difficult to prove. It is often the migrants’ word against that of the police. When we tried to visit, unannounced, the barracks of the border patrol in Isaakio, a small village laid down on a bight of the Evros, the officials there sent us away very decisively. That, after having registered our documents in a vaguely threatening manner. “We worked on a series of cases where some Greek police officials were investigated for alleged mistreatments”, we are told over the phone by Mario Felice, from Malta, a member of the European Committee for the Prevention of Torture (CPT) of the Council of Europe. “To be efficient, these investigations have to be immediate, extensive and carried out by independent bodies. Unfortunately, till this day, for the cases we have analyzed, these elements are unsatisfactory”. From 2005 to 2009, Felice led 4 CPT missions in Greece. This high frequency was due exactly to the serious worries on the detention conditions of the irregular immigrants set by the Greek Authorities. “Even though our recommendations are acknowledged, up till today this has unfortunately not led to any significant improvements in the detention conditions of irregular migrants. On EU’s external borders, Greece is going through some obvious difficulty”, Felice claims. “This one, though, has been going on for too long to keep talking about a crisis”. His point of view has been recently confirmed by a report from Doctors Without Borders (MSF), published last June. “Detention centers in Greece do not meet minimum standard requirements in terms of hygiene, space, protection from the cold and the heat”, the organization claims. According to MSF, these centers are overpopulated and lack any privacy. Food and soap are distributed irregularly. The problem is made worse by the fact that migrants are imprisoned systematically, even though the Greek law states this measure is only to be adopted as an extrema ratio (extreme measure). Among the most significant difficulties, is that of guaranteeing migrants the right to medical and legal assistance. According to Amnesty International, “lawyers who have tried to offer their assistance to the migrants detained in the centers in the Evros area were met with great difficulties and resistance from the Authorities”. Then, as far as the migrants go, regaining freedom does not mean the end of problems. Usually, once they receive the expulsion order, they go to the main cities in Greece (mostly Athens and Thessaloniki) where, with the help of some friends or relatives, they try to find a job or - in most cases – to reach another European country. Their position in Greece remains precarious nonetheless. Upon expiration of the 30 days, each of them can be arrested again on the grounds of lack of valid documents. And then the cycle starts again. The number of migrants and asylum seekers bound to the EU seems to have considerably decreased since 2009. Those who try to enter Europe, though, do so more and more through Greece. In 2009, 75% of the 106.000 detentions of migrants was carried out in Greece. This year’s first data claim the percentage is near 80 (source: Frontex). Athens is overwhelmed by a problem bigger than her. Until 2007, migrant flows were shared almost evenly among Greece and two other Mediterranean countries: Spain and Italy. Later, though, the debated bilateral agreements undersigned by Spain with Senegal and Mauritania, and those signed between Italy and Libya, de facto blocked the traditional routes of the Central and Western Mediterranean. The Greek efforts to reach similar agreements with Turkey have had a lot less success, at least for the moment. Athens’ annoyance towards Ankara on the issue is hence manifest. Actually, there has been since 2001 a readmissions agreement between the two countries. It has, however, never worked. The issue was again tackled during the recent and very much publicized visit by the Turkish Prime Minister, Recep Tayyip Erdoğan, to Athens, last May. Turkey committed to opening a permanent readmissions office in Izmir, and to readmit 1.000 migrants every year from Greece. More than anything else, though, this new agreement seems symbolical. “This way, the Turks kill two birds with one stone”, we are told in Orestiada by a police officer who prefers not to reveal his name. “On the one hand, they get rid of undesired migrants. On the other, they shift the problem onto us”. Without a functioning bilateral agreement, recurrent rumors make a heavy accusation against the Government of Athens, claiming it has carried out, during the years, illegal rejections towards Turkey, out of any legal setting. “They drove us till the Evros on military vans. There were 100-120 of us, many children. There, they made us get off and forced us to get on some ships. With those, they took us to a small island in the middle of the river. That way, the Turks could do nothing to prevent it. It was November 15th, 2006”. The story of Jamal (another made-up name), a Palestinian, many times rejected and gone back to Greece, is tragic and circumstantial, even though difficult to prove. That night Jamal claims he swam back and forth between the small island and the Turkish bank to save his wife and 6 children. “I was blue because of the cold. I could not stop screaming and screaming for help, until the Turkish Jandarma came and took us away”. It seems that the Greek government has not been able, in the past few years, to propose an organized and comprehensive line to face the question of immigration, always moving in the prospect of a permanent crisis. The current economic problems, which have led Athens on the brink of collapse, will hardly make things easier in the near future. Of course, the problem does not only concern Greece, but the EU as a whole. For the vast majority of migrants, the crossing of the Evros is only one step of the journey towards the richest countries in the EU, especially Great Britain, Germany and Holland. In recent years, along with the traditional sea route towards Italy, under increasing patrolling, the route passing through the Western Balkans (Macedonia and Serbia, towards Hungary) has been more and more passed through. According to Frontex, “in 2008 and 2009, the Balkan route was more and more used as a transit route for those illegally entering Greece from Turkey and trying to reach other countries of the EU. Suffice it to think that, during the first 5 months of the year, as many as 186 migrants (mainly Afghans) were stopped while trying to enter Hungary from Serbia, in the area of Horgos. Greece does not hide deep dissatisfaction with what is perceived as opportunistic behavior on the part of the rich partners of the EU. “I believe that the European Union finds it convenient to use Greece as a shield, and that up till today it has not tackled the problem very reputably”, UNHCR Pavlos Vogiatzis, prefect of the Island of Lesbos has recently declared. The Island has been one of the “hottest” landing places on the Aegean route. The EU strategy seems to be all focused on the security and control of the borders, and very little on the searching of the roots of the problem and possible long-term solutions. In the meantime, European states keep passing the buck or tendering the management of the migrant phenomenon to states, such as Libya, with extremely bad traditions in the field of respect for human rights, according to the “what the eye doesn't see the heart doesn't grieve over” principle. Going back to Greece, today the Union finances up to 75% Athens’ 2007-13 plan on the protection of external frontiers (reported around 200 million Euros in total). These funds seem, however, to be very far from being enough. It does not seem that the recent news of the opening in October of a pilot Frontex office in Pireaus can significantly change things either. Notwithstanding the words suited to the occasion, as written by The Economist, the Greek Government is leaking obvious signs of frustration. According to the Greek Minister for Internal Affairs, Michalis Chrisochoidis, the initiative is only “a drop in the ocean”. There are no signs of a possible improvement on the short-term. In the meantime, to use Vogiatzis’ words “the way refugees are being treated today does not honour anybody, neither us as Greeks or the EU”.